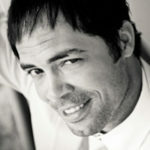 As a VMware and VMworld veteran, I have to begin this article by simply saying WOW! This VMworld felt, and it looked different than previous. There was an infectious excitement and energy in the air that pretty much grabbed hold of everyone in attendance. Last week was full of announcements from just about every vendor in attendance. The majority of the announcements were focused on new technology innovations, integrated solutions, and new products. 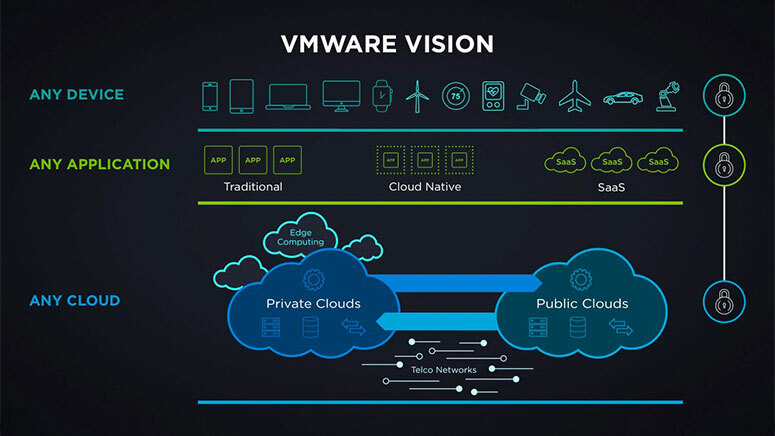 VMware presented the extension of their overall vision around cloud, applications, and devices which now include edge cloud computing, cloud services, software-as-a-service, security, IoT, and telco networks. VMware’s expansive vision unlocks many opportunities to introduce superior software innovations as well as better integration possibilities for the VMware eco-system of partners. As VMware continues to extend their product portfolio with solutions that span beyond the traditional on-promise data center. The focus to deliver a ubiquitous engineered software stack that can be deployed in private and public clouds is eminent with solutions and product offerings like VMware Cloud on AWS. VMware’s fundamental approach to delivering their vision for the Software-Defined Datacenter is based on the new integrated cloud infrastructure platform for hybrid clouds known as VMware Cloud Foundation. When looking back at all of the announcements, you could see that regardless of the new partnership, integrated infrastructure cloud solution was being announced they were all based on VMware Cloud Foundation being the underpinning of all of those initiatives. It was great to see the new approach VMware is taking to delivered customers a globally consistent engineered infrastructure platform as code that offers consistency, flexibility, and control from clouds to the Edge. This is an approach that makes sense for VMware; it’s customers and the partner eco-system. To complement VMware’s visionary approach, Cohesity and VMware collaborated and put together a solution that enhances the availability and recoverability capabilities of the VMware Cloud Foundation stack. Cohesity’s enterprise protection and recoverability for VMware Cloud Foundation provides a way to quickly protect and recover the entire software management stack (management workload domain) in a matter of minutes. Cohesity’s enterprise protection and recoverability capabilities allow VMware customers to overcome the challenges previously faced when needing to overcome from partial or complete infrastructure failure scenarios with strict RPO and RTO. The solution is designed to deliver the same value for private, public (AWS, Azure), and hybrid clouds. 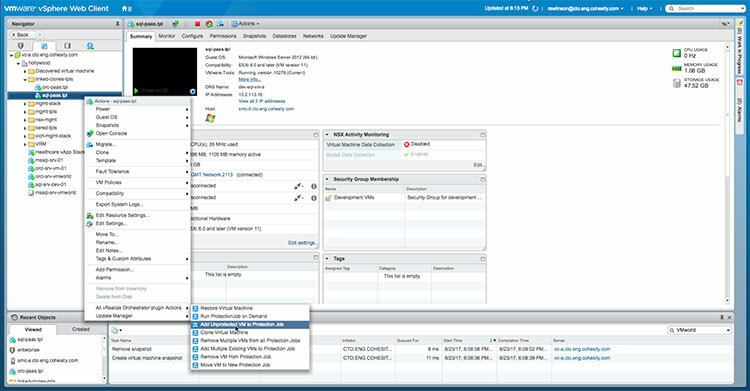 We also introduced an integrated and simplified management solution that allows vSphere administrators to perform all of the necessary infrastructure protection and recovery functions directly from their native vSphere Web Client. 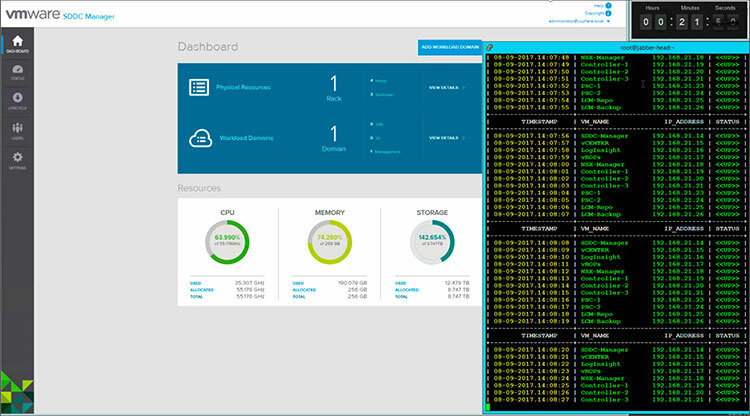 With the right privileges, a vSphere admin can launch any of the supported protection and recovery tasks from the vSphere Web Client without having to go to the Cohesity Cluster UI. 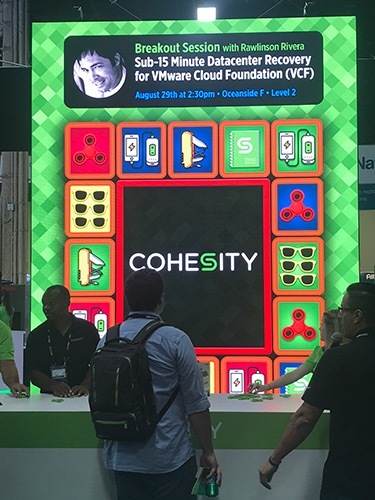 The Cohesity booth and party were amazing, and it was a definite contribution to the fun of the event. Kudos to Cohesity’s Mike Kim and his team, James Liu, Andrea Chow, Diana Bustamante for the amazing booth, the games and for making everything so entertaining and fun for everyone. Linda Sim, Andy Chacon, and Reverie Hara for running all the cool and excellent social media efforts and capturing great pics of the excitement of the event and sessions. Let’s not forget all the SEs and staff that supported the booth for the entire event. There were so many great announcements, and great moments last week but I’m sure there will be much more slated for next week in Barcelona. Let’s see what happens and I hope to see as many of you as possible in Barcelona. Hasta Luego y nos vemos en Barcelona!! !.